Once upon a time .. there was a home that never wasted a pound of food. No, not in a fairytale, but in the real-life story from a not-so-distant past, when food was precious and sometimes scarce, and people held it in high regard. State of the art(and size) freezers and food abundance have induced somewhat careless food keeping routines. We have lost both the knowledge and the confidence to decide how long and how to best preserve our food. The sad outcome lurks at the back of our fridge in a form of non-distinguishable slime. 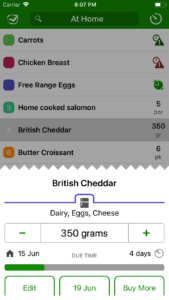 CozZo 1.7 was developed with the purpose to assist you in regaining your food keeping confidence and in doing day-to-day product list handling a lot easier. We will suggest you the optimal storage place for every product and food category, every time you create a product or look up its details. Wondering if it is best to store the strawberries in the fridge, the freezer or the pantry? No need to second guess, the icon will guide you. Confusing expiry dates, combined with the fact that we’re always in a hurry, has made us overcautious when determining whether food is still good to eat. 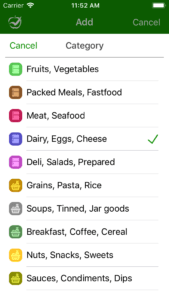 In order to help you get the maximum from your food, we will suggest the longest optimal shelf-life for each product, as you pick it from the autocomplete list, depending on the selected storage, and adjust it if storage is alternated. Our shelf life data is based on an independent assessment made by professional chefs. List of Frequently added Products. 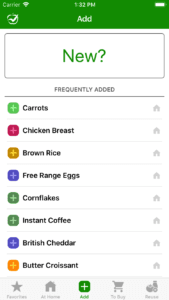 When you crossed-off items from your shopping list, CozZo automatically moves the product to your home inventory. But what if you just bought some stuff spontaneously? A new list in our “Add” screen, called “Frequently added”, helps you move your ad-hoc purchases directly to the “At Home” catalogue. We generate a personalised list from your recent top purchases, so concise that you scan it in a second and a swipe. 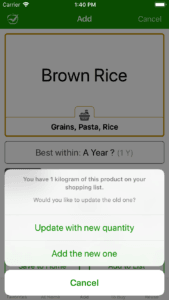 Tap to open the product to check the suggested shelf life, quantity and units (auto-filled) from your last purchase. The Home and Cart icons on the right will prompt you whether the product is already in “At Home” catalogue or “To Buy” list. 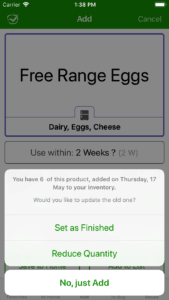 Another improved CozZo feature is the ability to swap products and prevent double adds. If a similar product already exists in your home inventory list, we’ll ask you what you wish to do with the old one? Finish it? Reduce the quantity or just to add the new one? When you add a product that’s already on your shopping list, we will prompt you on whether you just want to revise the quantity or you actually want to buy both products. 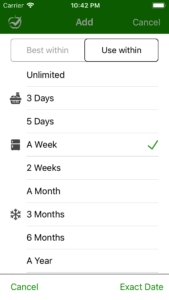 Finally, when you add a product directly to your home list, we’ll automatically remove it from your shopping list. CozZo 1.7 is available on USA, UK, Ireland, Netherlands and Bulgaria App Stores for iPhone 5 and newer.